﻿Cquartz Finest Reserve and Cquartz Professional certified Cquartz Finest Reserve Certified Rated 5 / 5 based on 21 reviews. CQuartz Finest RESERVE is the most exclusive coating on the market. We’re proud to be Palm Beach’s ONLY CQuartz FINEST Reserve installer. CQuartz Finest Reserve installers are hand selected so you have the comfort of knowing they have the skills to polish your paint to the highest level. Only AUTHORIZED CQuartz FINEST RESERVE installers appear on this map. WHY USE CQUARTZ FINEST RESERVE? • Enhanced Chemical and UV Protection – Next-Gen tech in Finest Reserve amps up the protection against man-made and environmental hazards alike. Pollen, bird droppings, industrial fallout, and strong ultraviolet radiation no longer reach surfaces once protected by Finest Reserve. • High Density – Next Sio2poxi tech results in a tough 3+ micron thick coating, yielding increased abrasion resistance and reducing the occurrence of wash-related marring. 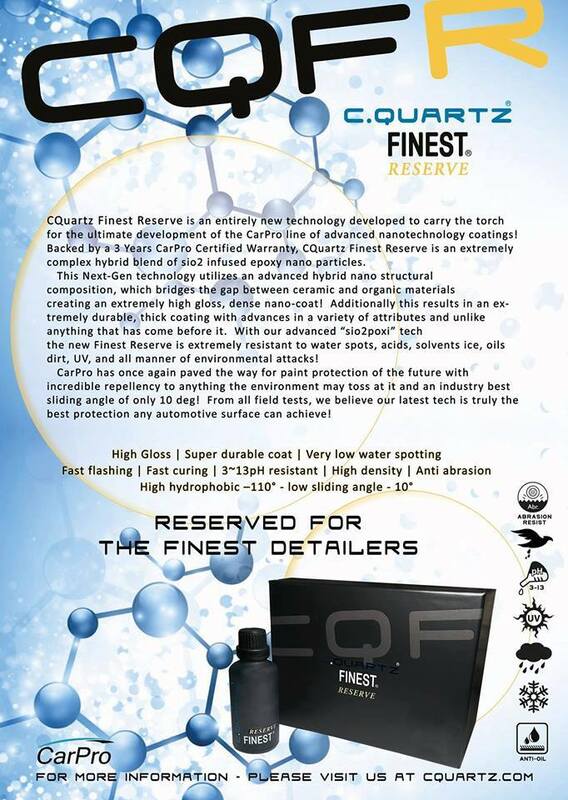 CQuartz Finest RESERVE is a totally new advanced nanotechnology coating! This Next-Gen technology utilizes an advanced hybrid nano structural composition, ceramic and organic materials create an extremely high gloss, dense nano-coat! The result is an extremely durable, thick coating with multiple advances in a variety of attributes unlike anything that has ever come before it. Cquartz Finest RESERVE is oleophobic. It has incredible repellency to anything the environment may toss at it and an industry best sliding angle of only 10 deg! CQuartz Finest Reserve advanced "sio2poxi" tech is extremely resistant to solvents, water spots, acids, ice, oils, dirt, UV and all manner of environmental attacks!